Because Fig. 430 and Fig. 431 Steam Jet Exhausters can be operated with compressed air, they can be used in places where steam is not available or where heating might be objectionable. When operated with compressed air, they can be used to move solids. Steam and Air Jet Exhausters operate on the jet principle. 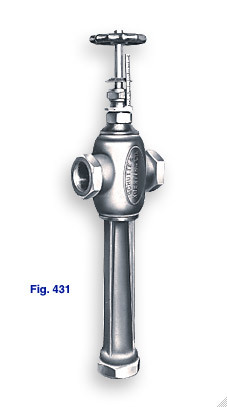 Live steam or compressed air enters the exhauster through an inlet and flows through an expanding nozzle. Issuing from the nozzle at high velocity, the jet discharges into the diffuser, produces a powerful suction which entrains air or vapors through the suction connection, and compresses the air or vapor enough to discharge against backpressure. The versatility of stock units with spindles offers a wide range of operating pressures at a lower cost than specially designed units. Simplicity of operation, and no moving parts provide lower maintenance costs. Mixing steam and air to alum digester in chemical processing. Steam Jet Exhausters are widely used for priming centrifugal pumps. For more detailed information about Steam Jet Exhausters & Compressors, Bulletin 4E Literature. To submit a Request for Quote (RFQ) for Steam Jet Exhausters & Compressors, Adobe PDF or submit an online interactive RFQ Form for Liquid / Steam Jet Exhausters. Fig. 431 Exhauster in Pump Priming Application. Steam Jet Exhausters are widely used for priming centrifugal pumps. The exhauster is mounted on the casing of the pump as illustrated and is used to exhaust air from the pump casing and suction line before the pump is started. Most pumps are located so that the vacuum created in the suction line and casing varies from the equivalent to a 5 ft. lift to that of a 20 ft. lift. Since the efficiency of a conventional centrifugal pump decreases rapidly with suction lifts greater than 20 ft. Most pumps are located so that the lift falls within this limit.